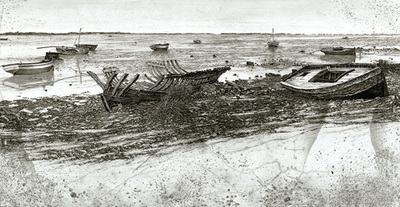 Another printing technique which falls in the Intaglio printing category is drypoint. 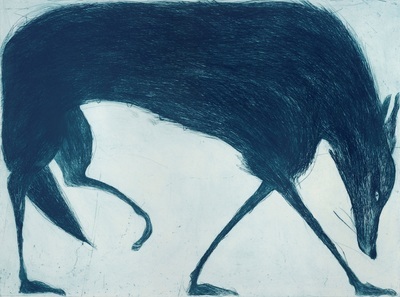 Pure drypoint is like an etching but it involves no wet acid. In simple terms one creates an impression of a drawing which, when inked, can be printed repeatedly. 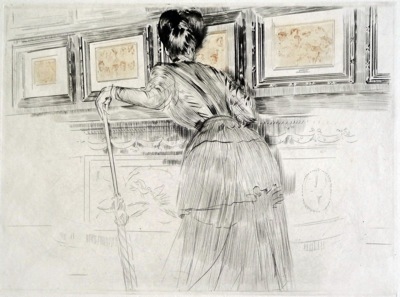 The artist works directly onto the surface of the metal plate, usually copper, with a drypoint needle or burin. The marks made by the needle create an indent / line in the metal which holds the ink. When printed this ink produces a rich smudge commonly known as a 'burr', in engraving this is polished away to give a clean sharp line, it is the residual burr which is the main characteristic of drypoint. Like the mezzotint technique the plate does easily wear, as the printing process wears away the burr, creating only a few good drypoint impressions, before the plate becomes tired, this can be anywhere between twenty to forty impressions. The introduction of steel facing allowed the plate to increases its life and so a hundred or more impressions could be made before the plate became tired.